Zimmerman Verdict & UPPSC Reservation Policy – Two countries where injustice prevails. The world’s oldest democracy and the world’s largest democracy are currently witnessing a common phenomenon. While the United States has been divided on racial lines following the high profile Zimmerman case, India’s most populous state of Uttar Pradesh has seen a similar division on caste lines due to the newly proposed reservation policy of the Uttar Pradesh Public Service Commission (UPPSC). 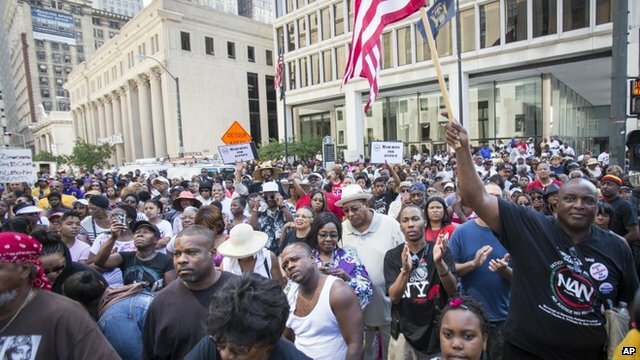 As far as the magnitude of the controversies is concerned, the Zimmerman verdict has certainly attracted a greater response with protests erupting across 100 cities in the US following the acquittal of Zimmerman. 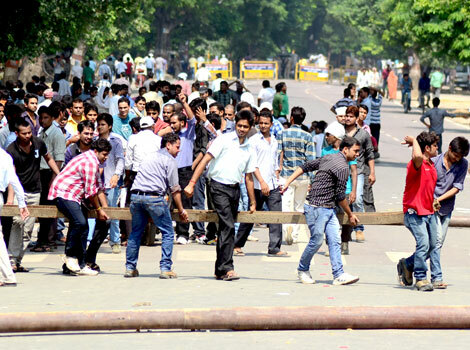 Protests against the new UPPSC reservation policy have remained concerted around the holy city of Allahabad which has witnessed angry protesters vandalizing shops and burning cars amidst presence of high security. These two developments taking place in two different parts of the world are indicative of the polarizing effect of race and caste and also the accompanying discrimination and injustice underlying them. The Zimmerman trial pertains to the killing of Black teenager Trayvon Martin on 26th February, 2012 in Florida by a White Hispanic neighbourhood watch coordinator George Zimmerman. Zimmerman was charged with second degree murder and manslaughter but he pleaded not guilty on account of having acted in self defense following a violent encounter with Trayvon Martin. In the court case that followed, Zimmerman was acquitted and released by an all white jury. This judgement has polarized the American society on racial lines at a time when the country is being governed by its first Black President and inter-racial marriages are at an all time high. The killing of Trayvon Martin has reignited and brought to national limelight the insecurities and frustrations of a community which has historically been subjected to humiliation and slavery. This controversy has also in some way reminded us of the changing dynamics of the United States where sooner or later, the Whites would slip into a racial minority. It was not a long time back that Blacks in America couldn’t vote. White supremacists in the United States still view the Blacks as a burden on the nation and consider them to be capable of only doing menial jobs. In his first public comments on this high profile case, US President Barack Obama said that he could have been Trayvon Martin. He said that it wasn’t unusual for Black men to be followed in the evening while returning to home. He mentioned that while walking down the road, Blacks could often hear car latches going down. This was an indication of a very negative perception regarding Blacks as they are often viewed as drug lords or potential criminals and gangsters. The race problem in the United States shouldn’t be viewed with a parochial lens. In fact it should assimilate into its ambit several other issues pertaining to acceptance and multiculturalism. Why is it that even after 200 years of establishment of democracy in the United States, only 1 American Muslim, American Buddhist and American Hindu each has been elected to the US Congress? Why is it that prior to election of Barack Obama, all US Presidents were male, white and Christians? Why is it that there is opposition to the construction of Ground Zero Mosque even when 100 Muslims were a part of thousands of innocents who died during 9/11? These are questions which cannot be easily ignored by a country which claims to be the “land of the free, home of the free”. Reservations have always been a dividing issue in independent India. The decision of the Uttar Pradesh Public Service Commission to open seats of the unreserved category to applicants from both the reserved category and general category has invited mayhem from upper caste applicants belonging to the General category. The move is likely to ensure minimum representation of general category students in the final selection list. This is not the first time that the reservation policy is being challenged. No commentator or analyst in India could forget the anti-Mandal Commission protests which occurred during the early 1990s. The protesters in Allahabad have received messages of solidarity from countrymen who want to save the nation from the curse of caste based reservations. They argue that caste-based reservations give preference to a person’s caste rather than his marks, talent or ability. They also argue that it leads to a mismatch wherein an under-qualified person occupies a seat in a high office or educational institution. Some have also said that caste based reservations strengthen caste identities and lead to reverse discrimination because of which upper caste people suffer. Others say that such reservations even hurt the progress of lower caste people as all their advancements are brushed aside in the name of reservations. What such people fail to realize is that there is a historical dimension to the caste problem. People who are born in lower castes face certain imposed social disabilities. It is true that reservations were initially planned to be done away with in 10 years but that was so because it was expected that social inequities caused due to the caste system would cease to exist by that time. This never happened. In the remotest of villages of India, lower caste people are still meted out inhumane treatment. They are denied entry in villages and temples and stopped from drinking water of public wells. Access to education remains minimal for lower castes and prohibition on inter caste marriages is a virtual law. Some of these disabilities have even contributed to caste wars with caste killings in Tamil Nadu and Bihar. An upper militia by the name of Ranvir Sena murdered thousands of Dalits on account of lower caste support for Naxalites. It is but obvious that people who are born and bred up in such conditions would face more difficulties than the one who has taken birth in an upper caste family. Positive discrimination or affirmative action isn’t relegated to India. It’s practised in nearly every corner of the world in some form or the other to ensure advancement of downtrodden groups or oppressed sections of the society. It is through reservations that the Indian government has tried to educationally uplift the lower castes. Reservations are the best way through which an under-represented section of society can get due representation. The notion behind having reservations in public jobs as stated by BR Ambedkar in an interview to the BBC in 1955 was to enable persons from lower castes to occupy strategic positions in the government through which they could look after the welfare of their community. Dr Ambedkar’s dream is yet to be realized as benefits of reservations haven’t flowed down to the lower castes. Only 11.6% of the SC’s and 4.6% of the ST’s are employed in Group A services of the Central Government. Out of the 93 secretaries of the Government of India, there is not a single Dalit. Anyways, the answer to avoid divisions in the name of reservations is by increasing the number of seats in educational institutions and public sector jobs. If there is space to accommodate everyone, then opposition to reservations would gradually dilute as opposition basically props up when instead of creating new seats for the reserved category people, the government carves out a certain portion of the seats from the existing few. Secondly, reservations should be given to only those who deserve this. Announcing the entire Muslim community as “pichdas” or increasing the creamy layer for reservation up to individuals earning over 6 lakhs annually is just as ridiculous as denying reservations to Dalit Christians and Dalit Muslims. Thirdly and most importantly, politicization of reservations shouldn’t be allowed. Declaration of castes and communities as backwards should be supplanted with relevant empirical data based on wholesome analysis of the degree of their backwardness. Reservations can’t be utilized as electoral sops to strengthen vote banks. Geographically, the United States and India are two completely different nations but there are a lot of problems which these democracies have in common. Both the countries need to strengthen their levels of toleration and work towards empowerment of disadvantaged groups without letting the well-off sections of society think that their interests are being sacrificed. The essence of a democratic society lies in following the midway which accommodates viewpoints of all which is extremely essential and important.